Associated with prevention of sight problems (cataracts, AMD). 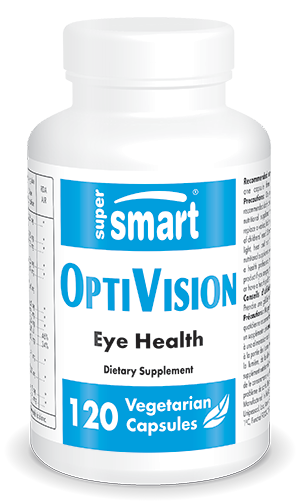 Our supplement Optivision has been formulated to contain a number of natural extracts recognised for their beneficial properties, particularly for vision. They include extracts of bilberry and blackcurrant which contain anthocyanosides. These are natural pigments which give the fruit their colour but which also have antioxidant properties. Our product also contains other antioxidant compounds such as extracts of grape seed and marigold. Grape seed extract is known for its high polyphenol content while marigold extract contains two antioxidant active principles: lutein and zeaxanthin. The antioxidant effects of all these natural molecules offers significant eye protection from certain aggressors. As well as a range of natural extracts, Optivision contains retinol, a form of vitamin A found naturally in the body and which plays an essential role in vision. In order to offer a complete formulation for eyesight, our supplement also contains glutathione, N-acetyl-cysteine, calcium folinate and sodium R-lipoate. These molecules act synergistically with the antioxidants to provide comprehensive protection for the eyes. With its truly comprehensive formulation, Optivision offers optimal protection for the eyes. The antioxidant properties of certain of its compounds protect the eyes from oxidative stress and combat the free radical damage responsible for cellular ageing. In particular, they protect epithelial cells in the lens, a crucial structure in the eye. Alongside these protective effects, other compounds in Optivision offer benefits for vision, such as calcium folinate which lowers levels of homocysteine, a molecule involved in several eye diseases. Other mechanisms of action have been attributed to our formulation such as preventing the breakdown of collagen in the eye and stimulating several of its enzymatic systems. As a result of all these effects, Optivision thus combats the decline in visual capacity by protecting the structure of the eye. Given Optivision’s protective effects, it offers significant potential for preventing the development of certain sight problems and diseases such as cataracts, age-related macular degeneration (AMD), glaucoma and diabetic retinopathy, which are often due to changes in cell structures in the eye. By combatting premature ageing of cells in the eyes, the various compounds in our product may be associated with prevention of sight problems. Apart from protecting the eyes, some researchers have found a link between certain compounds in Optivision and an improvement in visual capacity. This is described in an article in Nutranews which highlights a number of positive results related to improvements in night vision – the ability of the eyes to adapt to darkness. Other studies are underway to confirm benefits to the eyes related to potential harm from exposure to natural or blue light. Emitted primarily by computer screens, the latter is increasingly implicated in eye fatigue and the onset of visual problems. You may also be interested in other dietary supplements for maintaining visual health, such as the patented saffron extract Affron Eye® which contains potent natural antioxidants for protecting the retina from oxidative damage. There is also our nutritional supplement lutein, an antioxidant recognised for its protective effects on the retina, which in particular helps to prevent the development of age-related macular degeneration (AMD). The focus of many scientific studies, the compounds in our Optivision formulation provide optimal protection for our eyes and vision. They may also offer potential for preventing certain sight problems and improving visual capacity. To deliver all these benefits, our supplement is offered with a recommended adult dose of three capsules a day, though this can be adjusted in line with your therapist’s advice. Contains no sugar, salt, starch, yeast, milk, egg, shellfish, preservatives, artifical flavours or colourings. Adults. Take one capsule three times a day, or as advised by your therapist.